Japanese people usually set the day for the ceremonies or rites according to the recurring sequence of six days in the Chinese calender known as "Rokuyo." For example, there are certain days the funeals or wedding ceremonies should not be held. On the other hand, there are days good for wedding ceremonies. "Taian day" is the lucky day. and we avoid having events on "Butsumetu day" which is accosiated with Buddha's death. October 2nd was Saturday and "Tomobiki day", good day for wedding. 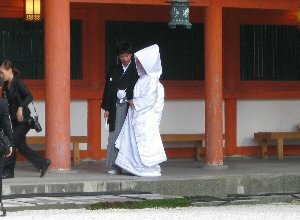 When we were in Heian shrine, we saw 2 couples having a wedding ceremony. The bride was in the traditinal bride costume. She wore a white cloth headdress and a white coat. I was a guide of honeymooners, we talked about the wedding ceremony and the way of wedding party for a while. More and more Japanese young couples tend to have a wedding ceremony in the western style. When I saw the brides in Heian shrine, I realized how nice the tradition was and how beautiful the traditional costume was, not to mention the bride. That was the last day in Kyoto for them. I took them the most of the places they wanted to visit in their list. 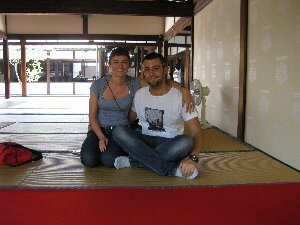 We went to Bamboo forest, Kenninji temple, Ginkakuji temple phylosophy path and Nanzenji temple along with Heian shrine. 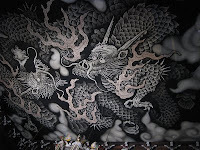 Kenninji temple is not so popular among foreign tourists. 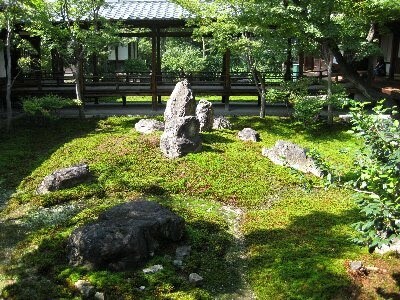 However, this is the oldest zen temple. We can sit down on the tatami mats and see the moss covered garden. In addition, we can walk a part of the garden and take a look inside of the typical tea room. The painting on the ceiling of the hall was fantastic and impressive. I think it worth seeing. I hope the tour with me will be one of the nice memories of their honeymoon trip. Dear Tomoko, we have beautiful memories of that day! :) Thank you very much!